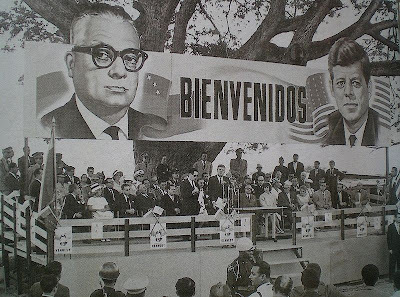 John F. Kennedy and Rómulo Betancourt at Alliance for Progress meeting in La Morita, Venezuela, Dec. 16, 1961. Image from Wikimedia Commons. The Castros of this world, the Kennedy Administration believed (as has every administration since), had to be crushed at all costs. The Kennedy Administration initiated a policy of foreign assistance in Latin America to complement the United States’ historic use of military force in the region. The President’s economic program was announced in the aftermath of long-standing complaints from Latin American dictators and some elected leaders that the United States had supported European recovery, the celebrated Marshall Plan of the 1940s, but ignored the Western Hemisphere. Most importantly, the Kennedy Administration and anti-Communist friends in the Hemisphere became increasingly concerned about the enthusiasm the Cuban revolution was generating in the region. In the midst of what was presented to the public as the “threat of Communism” in Latin America, Kennedy presented his “Alliance for Progress” aid package to diplomats and Congressmen on March 3, 1961 (about one month before JFK authorized the Bay of Pigs invasion). The Alliance, the President promised, would provide public and private assistance equivalent to $20 billion to Latin American countries over a 10-year period. The plan projected annual growth rates in Latin America of 2.5 percent and would lead to the alleviation of malnutrition, poor housing and health, single-crop economies, and iniquitous landholding patterns (all campaigns underway in revolutionary Cuba). Loans were contingent upon the recipient governments, and their political and economic elites, carrying out basic land reform, establishing progressive taxation, creating social welfare programs, and expanding citizenship and opportunities for political participation. However, the effect of the Alliance, even before Kennedy’s death, was negative. Problems of poverty, declining growth rates, inflation, lower prices for export commodities, and the maintenance of autocratic and corrupt governments persisted. The reality of the Alliance and most other aid programs was that they were predicated on stabilizing those corrupt ruling classes that had been the source of underdevelopment in the first place. The connections between the Alliance program and the interests of United States capital were clear. For example, a section of the Foreign Assistance Act of 1962 authorized the president to cut off aid to any nation that nationalized or placed “excessive” taxes on U.S. corporations or which terminated contacts with U.S. firms. The act also emphasized monetary stability and the kinds of austerity programs common to U.S. and International Monetary Fund aid, requiring nations receiving aid to reduce public services and to maintain low wage rates to entice foreign investment. Further, Alliance funds were often to be used to serve the interests of foreign capital; for example building roads, harbors, and transportation facilities to speed up the movement of locally-produced but foreign-owned goods to international markets. 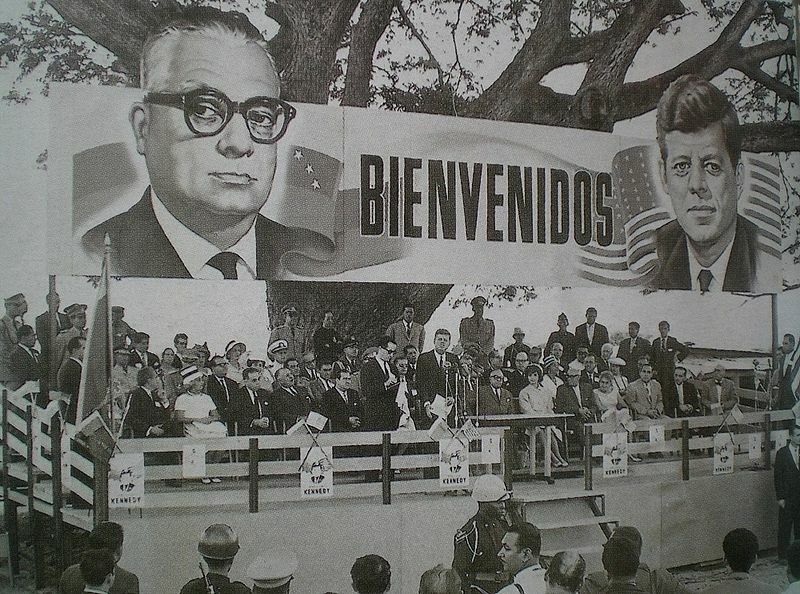 Finally, the symbolism of the Alliance proclamation by President Kennedy was designed to promote the idea that U.S. resources, in collaboration with reformism in Latin America, would create societies that met the needs of the people and encouraged their political participation. The Alliance was presented as a response to Fidel Castro, a “non-Communist manifesto”for development. The record of poverty and military rule throughout the Hemisphere suggested that there was no correspondence between symbol and reality. Kennedy, in a moment of unusual frankness, was reported to have said that the United States preferred liberal regimes in Latin America, but if they could not be maintained, it would much prefer a right-wing dictatorship to a leftist regime. After Kennedy’s death, Thomas Mann, Assistant Secretary of State for Inter-American Affairs in the Johnson Administration, told reporters that U.S. policy in the Western Hemisphere was not about economic development or democratization, but fighting Communism and protecting U.S. economic interests. In reality, the frankness about the motivations behind U.S. policy expressed by Kennedy after the Alliance speech and Thomas Mann after Kennedy’s death clearly showed that the bottom line in terms of U.S. policy remained support for international capital. The Castros of this world, the Kennedy Administration believed (as has every administration since), had to be crushed at all costs. What remained significant over the next 60 years was that the Cuban revolution could not be defeated. As the next essay in this series suggests, the Kennedy Administration, having failed to overthrow Cuban socialism at the Bay of Pigs, nor diminish its luster in the region through the economic bribery of the Alliance for Progress program, was willing to go to the brink of nuclear war, the Cuban Missile crisis, to combat socialism in the Western Hemisphere. This essay is the second of three articles that address U.S./Cuban relations that culminated in a crisis over Cuba that almost led to nuclear war. These essays are adapted from my book, Strategy of an Empire in Decline: Cold War II, 1986. Jay D. Jurie : 'Weimar Moment' or Chicken Little? Roger Baker : Which Side Are You On, Austin? 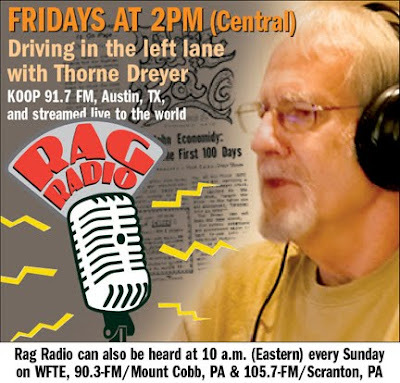 Danny Schechter : Is Iran Shifting its Message?